These neck coolers are one of the easiest ways to keep cool in really hot weather when you need to be outside, or just need to cool down quickly. We’ve used them at outdoor shows or in the garden, and the relief is pretty amazing. With the heat wave that has been going on in many parts of the country, and is now heading eastward, I thought I’d share this craft. Now, understand that these can be found for sale – very well done, nicely finished, and really worth the money. But… it’s the kind of thing you can make a dozen of for just a little money and time (although not as nicely done), and throw into the cooler with the beverages during the upcoming holiday. Having plenty of them will mean that they can be worn until they start to warm up, and then switched out with another, icy-cold one. You’ll need some polyacrylamide crystals, marketed as root water crystals in the garden centers across the country, and some fairly closely woven cotton material. Old sheets that have worn spots would be great for this purpose. Start with a strip of fabric 40” long X 5” wide. Fold it in half lengthwise, and sew it into a tube. Turn it inside out, and fold in half lengthwise. From the fold, measure 2 1/2” to 3” on each side. Sew ONE of those lines, widthwise. Add one teaspoon full of the crystals. Sew the other line, forming a packet that holds the crystals and reinforce the seam that runs lengthwise so that the crystals stay inside. If you’re hand-sewing, these three seams are the most important to use very small stitches on. The long initial seam isn’t too important, it just forms the tube. You can then finish off the ends of the tube by turning them in and hemming. Doing so at an angle is a nice touch. Submerge the neck cooler in cold water for about 15 minutes, and apply. It will stay cool for quite a while, and when it starts to warm up, flip it over for further cooling. Throw it back into the cold water and it’s ready to use again. It will be about 3/4 – 1” thick in the pocket. These are reusable until the cloth wears out! Just allow them to dry naturally. The crystals release the water and return to their tiny dry selves. Until you need them again. Years ago, working in a factory that had no air-conditioning, I discovered that fruit can make a huge difference in extreme heat. Later when we worked long days in costume at a renaissance festival, strawberry and banana smoothies saved us on many afternoons. There have been a lot of pictures and recipes for fresh fruit popsicles showing up on the various social media sites lately, but the thought of whole chunks of frozen fruit molded into a solid form, while beautiful, in reality seems like it would be messy. I got out the blender instead. The basic “recipe” was 2 small bananas, a generous handful of frozen strawberries, an equally generous handful of mixed wild berries, and about 1/4 lime (rind and all). About 1/4 cup of water was added to help the blender, but that probably wasn’t necessary. It was good, though. The resulting fruity goop was naturally sweet and thick. It poured easily into the molds. The part that didn’t fit into the mold was delicious, and the tiny chunks of lime rind were really a nice addition – as were the tiny fruit seeds. Into the freezer for a few hours, and the popsicles were ready. Delicious! This is definitely something I’ll be doing all summer, but the popsicle molds probably won’t be a part of it. Reusable lidded cups would work much better for us. We’re all adults, and it is murder getting those molds to let go without pulling the stick out. Peaches will soon be ready, and all of the luscious summer fruits – melons, berries, nectarines, pineapple… I can’t think of a fruit that wouldn’t work. Herbs could be added too, but for the most part concentrated infusions in place of the water used above seem that they’d be best. Give it a try if you find you have leftover fruit. The banana gives it a creamier texture without overwhelming the flavor of the other fruits. During the past week, we’ve been noticing the yarrow popping up and blooming. It isn’t quite in full swing yet, so in preparation, I thought I’d post a past article on this deceptively diminutive flower. We gather it throughout the summer to dry for use in teas, salves, tub teas and tincture. Don’t pass up this sweet weed. With a lot of gardeners, yarrow, Achillea millefolium, is a love it or hate it plant. Sure, it has Napoleonic tendencies, marauding through the garden, but its many admirable qualities override this small flaw. I find it to be a beautiful, durable garden plant that blooms happily away in neglected areas of the yard in full sun, poor soil and limited water. Homer’s warrior from the Illiad, who learned of its healing qualities from the centaur Charon. Constantly fighting over one thing, or another he used it to heal the battle wounds of his warriors. Some of its common names include Soldier’s Woundwort, Knights Milfoil, Bloodwort, Staunchweed and Nosebleed. The first time I witnessed the curative powers of yarrow was when I ran a landscaping company. One of the boys on my crew was prone to profuse nosebleeds, occasionally sending him to the emergency room. While we were working away one afternoon I heard the familiar exclamation as Cameron started spurting blood all over the shrubbery he was pruning at the time. Having recently read about yarrow’s styptic qualities, I instructed him to chew up some nearby leaves and stick them up his nose. The rest of the crew jeered and laughed but he did it. We were all amazed and repulsed when Cameron pulled out the bloody bolus and the bleeding did not resume. Since then I have used the chewed leaves of yarrow as one of my favorite trail medicines to stop bleeding and temporarily disinfect cuts and abrasions. Yarrow has a surplus of healing qualities. It is used for the internal bleeding of heavy menses, bleeding ulcers and hemorrhoids. Native Americans used it for everything from bleeding to urinary disorders and digestive ailments. Yarrow has been used to reduce fevers, relieve chest colds and as a digestive and general tonic. The roots have been chewed for sore gums and teeth. I have used yarrow as a disinfectant tea to wash injuries and skin rashes. Yarrow contains salicylic acid, which is a pain reliever used in aspirin and has anti-inflammatory properties. I’ve also heard it makes a good hair rinse. I find a lot of herbals recommending yarrow as a tea. I guess, if you like bitter. I prefer to make a tincture or capsule of the dried plant, thereby missing out on the tongue curdling taste. Yarrow seems to have a split personality when it comes to magical properties. On one hand it was thought to be a favorite of the devil, used in evil spells. Two of its numerous common names are Devils Plaything and Devils Nettle. On the other hand it was often used to protect against evil. Sprigs were tied to cradles to prevent witches from stealing a baby’s soul. It was also worn and strewn over thresholds to protect against evil. Try it the next time the in-laws visit. Yarrow was used in love spells and divination, the stalks are used in readings of the I Ching. For a durable garden plant yarrow is hard to beat. A hardy perennial, it grows from 1-3 ft high, depending on the variety. It blooms from late spring through fall if you remove faded blooms. Flowers come in pink, red, yellow and the wild form, white. It has ferny leaves and straight stems. I often read that it makes a good companion plant, enhancing the health of plants around it. I don’t know where these authors live, but in my Colorado garden, I have to keep a close eye on yarrow as it likes to overrun my less assertive perennials, which hardly consider it a good companion, more like the neighborhood bully. I consider this it’s only drawback. Cut and hang yarrow flowers upside down to preserve for beautiful dried flower arrangements. Useful for so many things, easy to grow and beautiful to boot, what’s not to love about this plant? 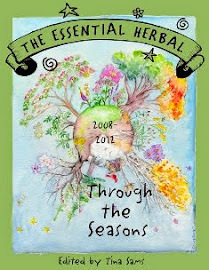 Susan Evans is a Certified Clinical Herbalist and owner of Chrysalis Herbs. 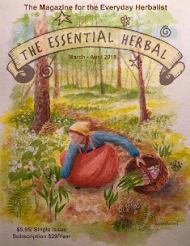 The newest issue is on the way to subscribers - filled with all the summertime herbal goodness you've come to expect from The Essential Herbal. Subscribe today for 6 luscious issues each year. Choose from print or pdf format! Musing on the harvested goodness of summer and how we obtain great food. Cover artist Suzan Scholl provided a quiz that takes the cover from being a picture into a learning opportunity. You'll love it! An ancient people, we still use many of the same herbs today. A cool, delicious dish to serve family or friends in the heat of summer. Rose Geranium, to be precise! Herbal relief from summer's ravages on the skin. 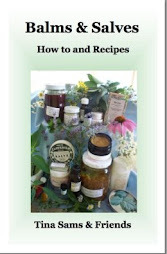 Learn to make a tincture, salve, body scrub - and more! Often thought of as a spring flower, we rarely see the apples. Time to look closer. Ready to grab your basket and go? Jeni will have you itching to harvest some wildlings. Oodles of delicious and delightful culinary treats made from roses. This article is one you'll want to keep for years to come. Quick and easy? You bet! Lots of new and interesting ways to use herbs and bring new zest to the table. Dandelions are still in the yard. Use 'em up! "Today, it is used mainly as a decorative plant, but it does have an interesting past as a culinary and medicinal herb." Lots to learn! 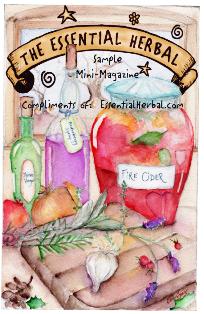 Full instructions for salve, lotion, soaps, and compresses for this wonderful, healing herb. If you've only tried tomato based salsa, you may want to check out these colorful, flavorful fiestas for the tastebuds. 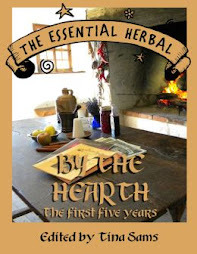 Susanna takes us for a visit with another fascinating historical woman herbalist. Gather those herbs and protect clothes and linens. Now that we have finally realized how much easier life is when we let a mailing house take care of shipping The Essential Herbal bulk mailing, that leaves a few days to breath after the completion of each issue, and he has been taking advantage of those windows. This time however, my sister's soap business exploded with orders in my absence, but that was sort of fun to come home to anyhow. I suppose Atlantic City is the "sin city" of the East. It's a fun change from the wholesome, good, clean fun we have at home on a daily basis. At one point, I noticed someone lounging on a counter and thought to myself "that person appears to have very long legs", before noticing that in fact there were stilts involved. The people watching is one of my favorite activities whenever I find myself surrounded by lots and lots of people. NYC is a favorite place for that, but AC comes in a close second. We took a long ride down the boardwalk one sunny, breezy afternoon. They've gotten rid of the trams, in favor of pushcarts. The man we hired told us that it was done to provide more jobs. What a concept, huh? The view from our hotel windows allowed us to see all the way to the tip of the island along the beach, as well as the bay. The skies blessed us with puffy clouds and beautiful nights. The food... Where do I begin? I'd LIKE to start with the individual meyer lemon cheesecakes smothered in fresh berries. In fact, I'd like to start everyday with that particular morsel. But we shared some of the best meals either of us can remember. I guess it helps that we didn't need to cook them or clean up after ourselves. In my opinion, that always makes everything taste better! The beach was really beautiful This early in the season, there weren't too many people on them, so it was easy and comfortable to wander along in the morning sunshine, kicking at pebbles and poking at seaweeds to get a better look. Might as well mention that the slot machines were fairly kind and let us go home with everything we took along, plus some change. A change of pace is a wonderful thing. Getting back into the usual groove is a little more challenging than I remember. The stack of orders is almost finished and ready for shipment. Most of the soaps have been wrapped and will be delivered over the next few days too. I'll just hang onto this little bit of pure happy, and pull it out if I need it on cloudy days. We've been friends for about 20 years, but I doubt if she knows how much I respect her or care about her. It seems like on those landmark birthdays, you look back over your life and wonder how you're doing with life and whether you're accomplishing what you'd like to do. Some people say that being a good friend is about all we can hope for in this life. Some would say that being a loving person would be the goal. Nobody really knows the answer, I guess, but she's got those two cornered. I knew her as a single woman, watched her meet and marry her husband, rejoiced over her children's births, and mourned the passing of her parents. She's been a reasonable ear/voice for some of my best and worst moments too and didn't remind me if/when I didn't heed her advice . I watch her juggle her family, full-time shop, speaking engagements, full schedule of classes, and friendships with awe. Like my own situation, she has a sister nearby who helps a lot and that cannot be underestimated, but she manages all of these things with grace and steadfast integrity. She's one of those people who, when the chips are down, steps up. Really steps up. She says, "this is what I can do for you, and I want to do it, and it's no trouble." She's the kind of friend who tells you when you're being an idiot. When you say something snarky about someone you both know, she defends them without fail. When you set up next to her at an herb faire, she'll start selling your products and setting you up with people who are looking for a speaker or a writer. She has a dry wit that took me a while to peg, but now makes me laugh til I choke. She's a fantastic writer, a brilliant and seasoned speaker, and knows more about herbs than just about anyone I know, besides being modest to a fault. Happy Birthday Susanna Reppert. Love you. I've been whining about weeding a lot lately, but a new rechargeable battery powered (lightweight!) weed whacker has really solved that problem. In my high school year book, someone or some group anonymously made a list of 10 year predictions about different people. For me, the prediction was: "Will still be trying to get out of work." That stung. I didn't even remind myself that I'd held paid jobs from the age of 14 or worked at our home business for many years before that. No... it just made me feel lazy. I was also well aware of how many times I'd rushed through my school work to knock off the afternoon and go swimming in the river with my friends, so accepted the slap and "owned it" for many years. It took a long time to realize that doing less work while accomplishing the objective is most certainly one of my strengths, and employers over the years valued it. That's sort of the point, isn't it? Nobody every says, "let's make this as hard as we can", do they? It should come as no surprise that when it comes to gardening, lazy is how I roll, too. Probably 95% of the plants we've put in are perennials that only require that we give them room to grow. The only annuals we put in each year are holy basil, culinary herbs, some white sage for distilling, and rose geranium for drying. The garden itself is mostly on either side of the split-rail fence that borders the tree farm that surrounds the house. It is a long row, and each year we take out one of the conifers that originally lined the fence on the inside to provide more space and more light. Usually, that tree goes home with someone to decorate at Christmas. The first year, the ends of the fence were planted with elderberry bushes and the gate was flanked with a vitex and some mountain mint. We put in a half dozen blueberry bushes that would eventually need to be replanted inside their own fence for their own protection. I got a package of sunchokes at the grocery store, chopped them up, and raked them into a corner. They've (of course) thrived behind the ever-spreading chamomile that I rescued that year from a construction site nearby. The thyme, chives, and oregano that were planted that year have become enormous and the echinacea has multiplied extensively. The next year, the fig tree came to join us, and it resides next to the wild black raspberries that I've decided to stop trying to bargain with. They can have that side of the house if they want it so badly. Valerian, balloon flowers, and a particular non-spreading variety of Japanese knotweed went in, and the butterfly bush started to spread. This year, we beat the groundhogs! Wild black raspberries are more stubborn than I. Somewhere along the line, along came the gooseberries, currants, and serviceberry. We also got some pawpaws, but that's never going to grow, I'm afraid. It comes up each year, and doesn't do a thing. The rows of different kinds of lavender are interspersed with St John's wort, comfrey, elecampane, sage, horehound, monarda, and anise hyssop. There's also a hardy patch of goldenrod that was encouraged to stay. Red currant is loaded this year. Gooseberries will soon turn purple and delicious. Persimmons this year? Yes, I think so! the neighbor's cherries, I might get some of them. Last year, I put in a sour cherry tree and a persimmon tree. A wee patch of stinging nettles went in, but needs to find a better permanent home. Horseradish and witch hazel came to live here, along with some butterfly weed and bottle gentian. The volunteer mimosa that sprouted the year before was guarded and will probably bloom shortly. This year, the side yard was planted with daylilies so that we can eat the buds in spring and early summer. New additions with be some perennial poppies and hyssop. Down below on the farm, dozens of bayberry bushes, rugosa roses, and hazelnut trees were put in. Part of their purpose is to provide food for the once common pheasants and partridges that my brother-in-law often raises from chicks to release back into the wild, which is a hobby of his, although they don't seem to stick around too much. I'm hoping some wild turkeys will stumble across our place and decide to stay. There is still the mowing, hand-weeding and occasional watering (although with perennials, they get over that requirement the second year.